This was something I found totally lacking in the 916 after my SS. The stock brakes just didn't cut it - I almost ran off the track at Willow. So I looked around and talked to some folks and got the Brembo GP master cylinder. What a difference! Combined with the cast iron rotors and Ferodo pads, the 916 nicely hauls down from any speed with two fingers. I've been talking to different vendors and many are saying that the newer "twin pin" calipers are much stronger than the older single pin calipers. I recently installed the Arrow 1/2 system. Finish is excellent, but fitment isn't perfect. Good, but not perfect. They're a touch louder than before, too. The 1/2 system eliminates the premufflers just inside of the right footrest with a much larger collector. 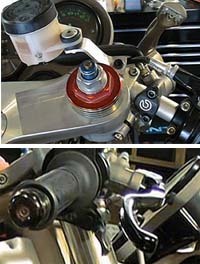 This system comes from www.motobella.com and at a great price and with an Arrow chip. The system gained 5.5 to 6 hp and my 916 made 105.5 hp. It did feel a bit stronger on the track - the bike was a touch louder and felt like it got better drives through and out of turns. Previously: The JHP cans are nicely quieter than the Staintune spaghetti system I had on the 900. With the Superbikes, ask around before committing to pipes if volume is a concern or desire. As always, carbon fiber fades and metal cans don't. Vance and Hines are supposed to be the loudest, but some TBR cans I've heard were very healthy sounding. With the Arrow system, I did some dyno tuning (thanks White Tip 619/644-1618) and found that the Arrow chip made the most power, 105.5. The FIM071 made 104.5 but had a pretty huge flat spot around 7000 rpm. The Event Technologies chip make 102, and popped and backfired noticeably. Previously: I've got the Event Technologies chip and will soon be trying out the FBF one. My 916 made 101 hp before I threw in the JHP air box filter and then 100 with it. I'm wanting to unleash a few ponies and maybe cure a low end stumble, too. In the end, I may end up buying a PROM reader/burner and start doing my own chips. I spoke with two customers and was convinced that I should try the Nichols lightweight flywheel. It really wakes up the motor! Combined with the 14/37 gearing, I was able to keep up with or even pull on 996s around Willow Springs. I do note a tendency for the 916 to stall easier while the engine is cold, but that's the only ill side affect I could detect. I also found that while rudely banging down through the gearbox, the rear wheel was less prone to skipping, which I consider a very positive improvement. I took apart the forks and found that there was little oil in them! There was also some rust starting on the spacers. I had to ask R-T for the shim stack to use as their stinkin online stuff again didn't work. I actually have yet to get thier online valving engine to work for me. So ensure you plan ahead if you're working on the weekend! When reassembling, I used all new seals and busings and set the oil level 10mm higher to help prevent bottoming. The forks previously were raised in the triple clamp about 5mm more than the factory manual specifies. I set the forks to the factory height and found that Ducati Corsa may know what they're doing afterall... the slightly raised front end (the stiffer springs surely added to the height) felt much lighter than before. The 916 is more willing to transition across vertical. The factory said that raising the front aided turn in due to moving the center of gravity higher. As usual, the Gold Valves help eliminate sharp bumps while still offering control over small ones. No doubt having oil in the forks helps, too. Being that Zina and I both ride Ducatis, it is wise to ensure that all bikes can carry a passenger. So, I picked up a biposto subframe and tail section. Note that the biposto tail can bolt to a "mono" superbike, but not necessarily the other way. The Mono subframe mounts the computer further back than the biposto. I read that article in Sport Rider and realized that my ulnar nerve was getting worked somehow. I think I could say that it is directly attributable to the 916 stock bars. The ulnar nerve affects the ring finger and pinky. In my case, I have excruciating pain along the outside of my palm, where folks squeeze when they shake your hand. Since the installation of the Heli bars, the pain is subsiding. I'll take a break from riding in hopes that it will heal. Anyhow, the break helped and I still ride a lot. Note that I raced with these bars and am even fast enough to qualify in ama supersport race at willow. =) Read more on the Heli bars on my Heli page. Afam developed a quick change carrier for the Ducati single sided superbikes. It allows the rear sprocket to be removed and replaced without pulling the center portion or disturbing the cush drive lugs. Further, quick change carriers offered sold in the US have flanges which positively prevent the cush lugs from backing out and machining the chain adjustment eccentric and swingarm. It is the only aftermarket sprocket carrier on the market to do this. I wanted more drive and am not especially worried about top speed performance, so I geared down more and went with the 14/37 gears and Afam's 525 Super Reinforced XRing chain. This chain is similar to the DiD252VM. I greatly enjoyed the extra drive and still have plently of rpm left in top gear around Willow Springs, so the choice was a good one. I don't typically make a habit of watching the speedo while riding on the racetrack, but did notice 140 after the start finish line. I was in top gear around 8500 (I think) so there's plenty of speed. 996 owners have even taller internal ratios, so they may want to consider 14/38 right out of the box. Update: I switched to 14/39 gearing for racing purposes and it woked quite well. The 916 pulls waay hard with this gearing, but the extra revs take some getting used to on the freeway! As a mechanic, I'd internally scoff people with the clamp on throttle locks as being wussies. I put one on my 900 for last year's trek to Laguna Seca, and it ruled. Makes 100 miles go by much easier. The HeliBars enabled me to make a nice long ride on the 916. Now to find a way to haul my trash on it! Some folks talked about Ventura, so I looked into it and got in with a distributor. Go to my Ventura page for pics and more info.